AlwaysOn today announced the AO100 Top Private Companies for 2006. The fourth-annual elite AO100 list was compiled by the AlwaysOn editorial panel. In order to make the AO100 list, companies had to be peer-nominated, with AlwaysOn receiving more than 1,000 nominations from venture investors, investment bankers and other industry experts. How can I experiment with something new? What do I want to explore? What do I need to read? What would I like to study? What do I need to practice? Many people are very resistant to change, challenge, anything new or different. Mark Twain said it best: "Why go out on a limb? That's where the fruit is." There is always something new to see, to hear, to taste, to experience. There are opportunities all around you. So, live it up and try new things. Everyone has a special gift of creativity. But, sometimes people need a little encouragement to discover their creative talents, especially children. In order to help kids' creativity shine, Hallmark Gold Crown Stores and Crayola products have teamed up to encourage the artistic expression and unbridled creativity that is so important in children's development. In the spirit of celebrating kids' creativity, Hallmark and Crayola products share these simple guidelines for unleashing the creativity in your kids. 1. Look for projects that can get your kids excited about art. Help your children find the art activities that they enjoy most, be it drawing, sculpting, painting, or something else and then take a passionate interest in helping them enjoy and excel in those areas. 2. Praise your children's efforts. Ask your children to tell you about their drawings or other art projects. Watch their eyes light up as your interest prompts a detailed explanation. Be sure they know how unique and creative you think their work is. 3. Give young children a hand. Depending on what kind of project children tackle, they may need your assistance to help fulfill their vision. Don't be shy about pitching in without taking over. This also provides cherished opportunities to spend extra quality time with your children. 4. Provide an art area where mess won't matter. Being creative can get a bit messy at times. Don't let that squelch your children's creativity, though. Create a special corner in a bedroom or family room specifically for art activities. Also, take advantage of structured outside art activities where someone else keeps things tidy while the kids keep busy. 5. Enjoy your children's individual talents. Show that you think their projects are special by proudly displaying them in your home and office. Remember, your supportive comments and enthusiasm will fuel their efforts and boost their confidence. 6. Start a scrapbook with photos of finished projects (or the projects themselves if they fit in scrapbook format). It may not be possible to display every artistic masterpiece. But you can keep a scrapbook of completed projects for kids and visitors to behold. You'll be surprised how much enjoyment others will receive by thumbing through the scrapbook and how many ideas for additional projects it generates. Creativity & Leadership both are the two different words but to develop them you need to have the fire. "Everyone has creative potential, but creative people think they are creative." Self-esteem is one of the most important elements of creativity. People must believe in their ability to develop original ideas and they must continue to believe in themselves after repeated failures. Creativity flourishes in an environment that rewards attempts, as well as successes, and is conducive to failure. People must feel comfortable failing before they will repeatedly take risks or attempt creative approaches. 1. Explorer. Finding new ideas and resources from which an idea may be built. 2. Artist. Transforming ideas (gathered by the explorer) into something new. 3. Judge. Ideas developed by the artist are evaluated and their merits are weighed; suggestions are offered on how they can be improved or further developed. 4. Warrior. Implementation of the ideas approved by the judge requiring persistence and determination. 10. We don't innovate around here any more. 9. Product life cycles are getting shorter and shorter. "And whose fault is that? If you do not differentiate in hard-to-copy ways, you cannot expect what differentiation you do create to be long-lived… Sustainable differentiation requires barriers to entry and barriers to exit." 8. We need a chief innovation officer. "Like a hole in the head. Think about what your true goal is: you want innovation that creates differentiation that leads to customer preference during buying decisions." 7. We need to be more like Google. 6. R&D investment is a good indicator of innovation commitment. 5. Great innovators are usually egotistical mavericks. 4. Great innovation is inherently disruptive. The January 16th issue of TIME magazine has a major section on "How to Sharpen Your Mind." 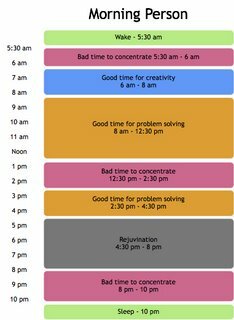 One of the key articles explores the best times of day for both "Morning People" and "Night Owls" to create, problem solve, rejuvinate and rest. I've re-worked the graphics presented in TIME for this post. 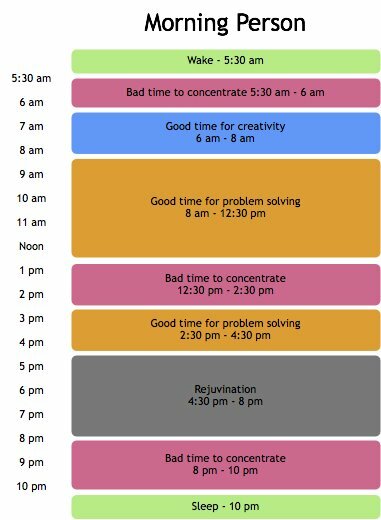 TIME says, for the early riser, "creativity generally peaks early in the wake cycle before distractions can impede the brain's imaginative focus." You are currently browsing the archives for the Creativity and Innovation category.